I’ve been evaluating quite a few bookshelf speakers this year, which has been really exciting for me. 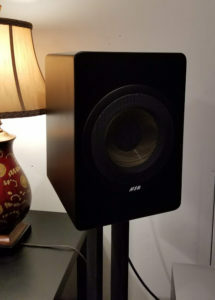 When I picked up the box for the Hsu Research CCB-8 “bookshelf speakers,” my first thought was the quote from “The Mummy,” as the child actor laments “Rather weighty, these.” As I pulled the beautiful black boxy speakers from the carton, I wondered to myself if my stands were going to be substantial enough for them. They turned out to be, but I did worry during my evaluation period. So, while these fall under the category of “bookshelf speakers,” and are really stand-mounted satellites, I will start this out by saying that I use both terms loosely and want to emphasize the heft and substantiality of these speakers. In other words, users should invest in a really good set of stands for these speakers right off the bat. The speakers came with direct instructions from Dr. Hsu himself as to how to place and where to cross the speakers over. Not simply because Hsu Research makes some of the better sounding subwoofers I’ve ever heard, but because of the inherent design of the speakers themselves, the CCB-8’s ($669/pair) are meant to be used with a good sub and crossed over at 80Hz. 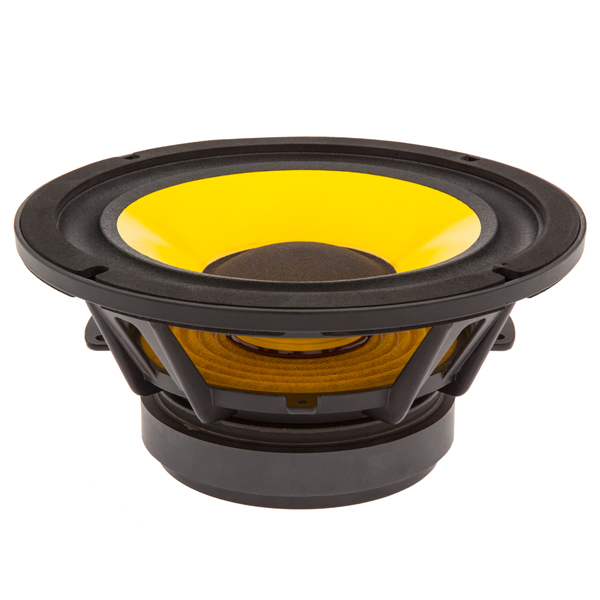 Though it would be tempting to hear these 8” coaxial speakers full-range, I have too much respect for the manufacturer here, and went with the design intention. I paired them with my Canton subwoofer. Where I initially went wrong was not properly heeding the instructions regarding toeing-in. These speakers are remarkably sensitive to placement! Perhaps it’s the coaxial design, perhaps it’s the cabinetry, I’m not sure, but boy did I get it wrong at first. I pointed them towards my listening chair, not quite toed-in all the way. The result was less than pleasant. They were harsh, and imaging was unrealistic. With the help of the very nice demo disc supplied with the speakers, and about an hour of experimentation, I got the toe-in right, pointing them to a mark just in front of my listening chair. From here, they became a completely different speaker. I did enjoy the demo disc but found that I really enjoyed a couple of SACDs even more. What these speakers brought out in Miles Davis’s “Kind of Blue” two-channel SACD was remarkable. There are many subtleties and undertones in this album that can be easily missed. The horns have this wonderful breakup to them that the CCB-8’s nailed. More importantly, the ride cymbal sounded clean and natural throughout, and well-placed in the sound stage. I wouldn’t say that these speakers have the biggest imaging or staging I’ve ever heard, but I think it’s that I simply don’t have enough space to accommodate them properly. These speakers could use a little more room to breathe than I can give them here. Still, they’re making the most of this environment. Instruments are evenly spaced throughout the sound stage, and there are no detectable holes in the spectrum at all. It’s a very smooth response. When switching over to something more challenging like Dead Can Dance’s “Within the Realm of a Dying Sun,” the CCB-8’s really came to life. 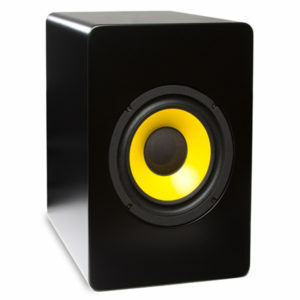 80Hz is absolutely the sweet spot to cross these over, as they integrate seamlessly with the subwoofer. The low-end response from the large satellites is everything I would expect from a speaker with a Hsu badge on the front. It’s tight, lively, but deep. Now, this set-up did take some experimentation with the supplied port plugs. 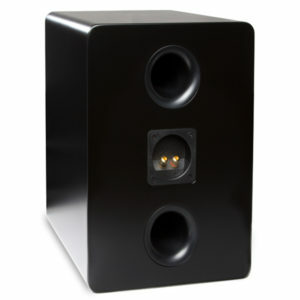 There are two bass ports on the rear of each speaker, and the user has the option of leaving these open, plugging one, or plugging both. I found that having both open made them a little too bottom-heavy for my tastes. Both ports plugged tightened them up too much, making them a touch shrill. Plugging the bottom port turned out to be the Goldilocks solution. Once the right configuration was achieved, these became a really fun speaker to listen to. As a matter of fact, I ended up writing a few articles on different pieces of equipment and music, all while listening to these speakers. That’s not something I usually do. If you can get past the somewhat unique look and heft of this speaker, and the extremely picky placement, you’ll end up with a very rewarding sound as a result. For the asking price, they are a veritable bargain, and definitely compete with speakers far pricier, larger, and exotic. Just heed the instructions, add good music, and enjoy! That’s a lovely review, Michael. Well said! I really enjoyed the read. I happen to think Dr. Hsu cares way more about all his product (and fine reputation) than most in this business. I’m sure he likes and needs money like all of us, but from my three or four conversations with people within his company, I never got the feeling that money pushes him like most. It seemed like it was about quality and getting my moneys with to me. I could be absolutely wrong but I don’t think so. Thanks for the great reviews and site!